Ellie turns four on Monday. 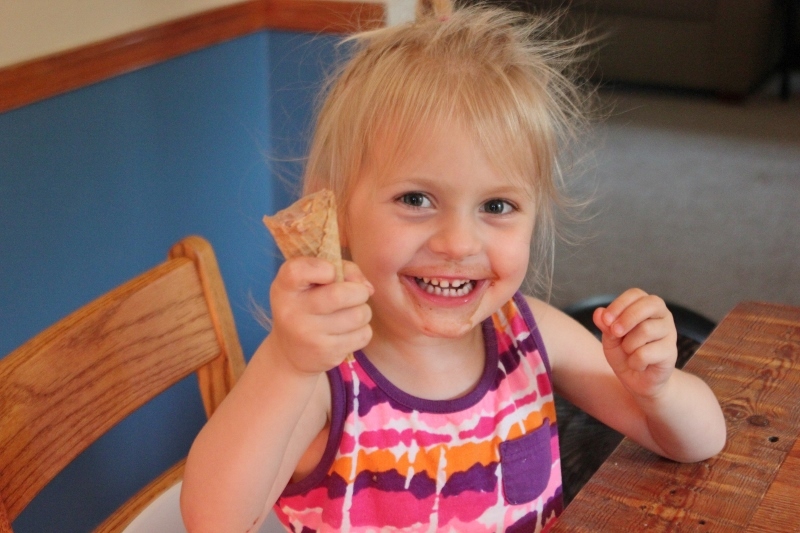 Early in the summer, we started talked to Ellie about weaning and she declared to us that when she was four, she wasn’t going to have nursing anymore. Frankly, I’ve been ready for her to be weaned for close to a year. Clearly, however, she wasn’t and it was just easier to keep on nursing (that whole inertia thing) rather than try to figure out the right words to say to help her be OK with weaning any earlier. This week, we’ve been talking every day about how her birthday is coming up and that means no more nursing. For the past year, she’s only nursed once a day, at bedtime, and only for about five minutes. Clearly, that’s not much nursing but it has been important to her and a clear way of marking bedtime. She has decided that she wants lots of cuddling at bedtime instead of nursing and that she wants to cuddle “usually with Baba and sometimes with Mama.” So that’s the plan – lots of cuddling to meet the love and comfort needs that nursing used to fill. I can’t say that I’m all that sad about Ellie weaning. (See my “ready for a year” comment above.) However, it is hard for me to imagine being with my precious daughter without her needing to nurse. She was a voracious nurser from the very beginning despite our struggles and continued to nurse really enthusiastically up until I started to cut her back when she was close to three. When my milk came in after Mark was born, she would be so excited to nurse, she would lie on her bed at bedtime, kick her legs up and down and shout, “NURSE! NURSE! NURSE!” She had nursed dry (i.e. gotten no milk) for so many months while I was pregnant with Mark that I think she had forgotten that milk was part of nursing! Tonight she told me that she liked “warm milk” (i.e. Mama’s milk) better than “cold milk” (i.e. cow’s milk). I’m sure she’s going to miss nursing too but it’s been fun to see her giggling with glee at being so grown up and OLD (because four is SO OLD) that she doesn’t need nursing. She’s my big grown up girl who loves to nurse and will love to cuddle and who is turning into a teenage. Yesterday, she told me, “You are totally wrong and I am totally right!!!! !” For the record, I was right and she was wrong. This entry was posted in Ellie, nursing. Bookmark the permalink.